Dr. Paul Thomas, M.D. is a board-certified fellow of the American Academy of Pediatrics who resides in Oregon. He took time out to attend the public hearing before the Oregon Senate Committee on Health Care, regarding Bill SB 442. This bill was written by Oregon State Senator and physician Elizabeth Steiner Hayward, who wanted to remove all philosophical and religious exemptions to vaccines in the State of Oregon. Dr. Paul stated that this bill, as it is written, is "a travesty." He stated: "We need to protect our children and preserve the right for freedom of choice, and the right to give informed consent when your child is about to get a vaccine." In testimony before the Senate Committee, Dr. Paul stated that he does not give every vaccine to every child in his practice, and as a result, he has over 1000 children in his practice over the age of 3, and NONE of them have autism. The rest of the country is seeing a rate of about one out of 50 children on the autism spectrum. He states that the "science is not settled" linking too many vaccines to autism, and that doctors like himself should not be coerced by bills like this one proposed in Oregon to give up the right to informed consent in regards to vaccines. 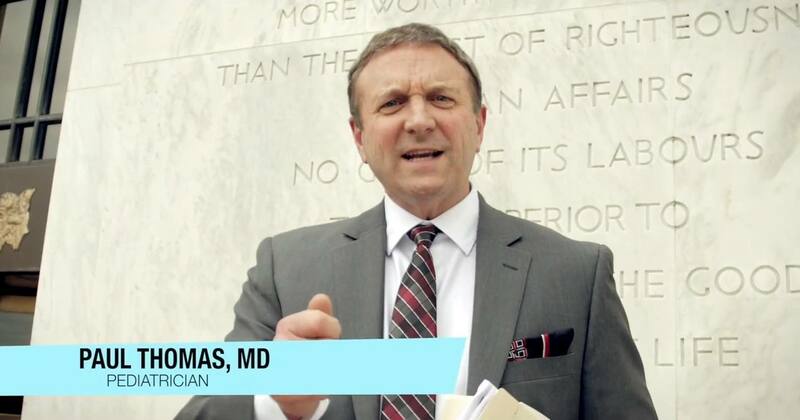 Dr.Paul Thomas, I want to personally thank you for your service. And, to bring You some clarity about where this push for forced vaccines is coming from. I was online researching the Pros and Cons of vaccinating children. I am a long time Activist and Advocate for Alternative and Natural Medicine, since 1965. I watch dog the FDA to keep Vitamin C on the Market and was able to stop the passage of the National Health Care Plan for a short time because of not enough wellness. And, then worked tirelessly to get a Natural Doctor and the Holistic Wellness concept understood for Holistic treatments. I own my a Petition Company and my family has been involved for 35 years. Here in CA, I am leading the way by training Fed Up Moms, who just lost their Parental and Religious Exemption and Constitutional Rights in SB277 bill passed into Law by Governor Jerry Brown. Moms are standing up in CA and using the Ballot Initiative By Petition Process to Veto by the Will and the Power of the People and Recalls of the Senator-Doctor Pan "bought" by CA Medical Association and Big Pharma in California (medical mafia). When 2000 mothers were silenced and the lobbyist were allowed to speak. My amendment for waiting for the immune system to fully develop, before beginning vaccines..... s-p-a-c-i-n-g.... and giving one vaccine at a time.... and allergy testing first, along with antioxidants to both mother and infants and children. HPV and Hep B is on the CDC Schedule within the first 15 hours of birth is a killer of infants. America has the highest infant mortality and first day mortality rates of all developed countries. These vaccines are given without the knowledge or permission of parents and records are withheld, too. The corruption exists at every level, city, county, state and federal levels of government along with . 100,000 signatures have disappeared from the Elections office in California....15 boxes of signatures. The incompetency and corruption of the Elections Office in every county across America needs to investigated and Public Transparency to prevail. **I just want You to know that The World Health Organization ( Who.org.) is behind this massive out reach to force vaccines in this country and globally. I read their Sales Promotion PDF. ** It was up for a few minutes and then it disappeared. The jest of their Sales Promotion for 2015-2025, " Come buy and Sponsor our vaccines to secure shared profits of trillions of dollars. How do we intend to do secure your future? By introducing "Forced Vaccines Laws" at the Congressional, State, and Heads of Countries, globally. And, by focusing on middle income families. The graphs shows out reach for manufacturing vaccines in the countries of USA enemies. And, vaccines will be imported into the United States by the TPP. Russia, Cuba, Philippines, China, Vietnam, Japan, and India, Korea. Atheist, Bill Gates has been on TV delighted because he is for zero population and the huge tax deductions coming his way. We know that the Who.org has been caught "falsely stating the effectiveness and safety of vaccines" and drumming up business for "false outbreaks" to increase sales and to justify their existence. The PDF shows Merck sales climbing from the millions back into billions for the Killer Guardasil, after buying our State Reps to pass the Anti-Parent Consent Bill giving the MD's the finale decision maker on vaccinations in California. Their sales dropped when it was learned by parents that young daughters were becoming physically impaired and deaths were reported. 32 died in the clinical trials and the FDA agreed to Fast Track it for approval in 15 months. We know that Governor Rick Perry tried to force this vaccine on his Young female Constituents. Why? Because he is or was on the Merck Board. I don't know if you remember when GW Bush Sr. signed into law a bill giving manufacturers of vaccines the right to hide or not list all the ingredients in vaccines when it was discovered that "peanut proteins" was the cause of death of infants, toddlers, and children. Why? Because he was on the Merck Board, too. Take Care, Sandi White in CA. Message me on Face book or email me if you would like to talk. I thank all the Drs. who have expressed their concerns, that is their oath, DO NO HARM not hide away for fear of the drug companies although I admit they are to be feared and when you read the details of the class action law suit in Australia over vioxx where some of their tactics were expressed in their own emails...discredit, neutralize, ruin them where they live. They wonder why no thinking people no longer trust them. It sounds more like the mafia. Thank you Dr. Thomas, I wish I had you for my children when they were younger. You are a courageous man. I thank you for giving my family a voice. I thank you for all that you are putting on the line to speak and share truth. I pray you're license does not get revoked. Thank you! It's not that they "do want to" acknowledge a vaccine/autism link, it's that they have a direct conflict of interest and are protecting their crimes with more lies. Protecting their M O N E Y while they've thrown our children off the cliff. Dr.Thomas and every other person who is stepping out of their comfort zone to spread the truth is my hero. They are America's Real Heroes much to the chagrin of the death merchants who hate such people's guts. Keep up the great work Sir, my family looks up to people like you. " Three things cannot remain hidden for long - the sun, the moon and the truth " Buddha. America is on the path to awakening. This bill will be defeated in OR senate setting a great precedent for 49 others. Truth shall prevail. It always has , it always will.God Bless and Namaste. Thank you very much Dr. Paul. You are a very important figure to fight for our rights to have freedom of choice whether to vaccinate or not. Vaccinations are all harmful upon my research. There is no reason to vaccinate a healthy child, adult and especially newborn babies. THIS IS MURDER!!! I'm sending my prayers of appreciation, protection, faith and hope. I am behind you and support you all the way. God Bless you and your families.Namaste. Mary Kay Elloian, M.B.A., J.D., ESQ.